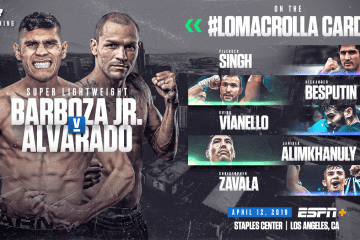 Both fighters in the main event made weight so we are official for tomorrow’s bout from The Staples Center in Los Angeles, California, televised on ESPN+, with Vasyl Lomachenko putting his WBO and WBA lightweight world title on the line. In the co-main event, former WBO super middleweight world champion Gilberto “Zurdo” Ramirez, who made five defenses of his world title, will make his debut at light heavyweight. The opening bout will be Arnold Barboza putting his junior NABF super lightweight title on the line against former world champion “Mile High” Mike Alvarado.